I'm speaking of a wood watch. Yes, wood! When I discovered Jord watches a few months ago through a blogger pal of mine, StushiGal Style, I was intrigued. 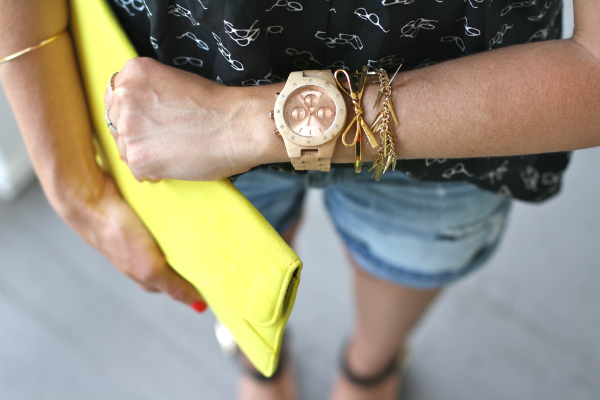 The wooden details are refreshing, and offer a sophisticated twist for any arm party. Added bonus, you can order the watch online sized exactly to your wrist. I was nervous the watch was going to be too small because I took the measurements myself, but it actually fits perfectly. It doesn't irritate me the way other watches do this time of year (hello, humidity). The watch itself is very durable. I've been wearing it daily for the past few weeks in replace of my Kate Spade, which took quite the beating and now looks very worn because of the leather band. Considering the main feature of my new watch is wood, I will not have to worry about the distressing of leather or metal. Jord offers a collection for both men and women. There's a variety of eye-catching colors, shapes and sizes. How cool is this purple heart & pearl watch? I also love the clever packaging. My watch arrived in an adorable wood box with a plush cushion. It would truly make for a great birthday, anniversary, or celebratory gift! To view more Jord Wood Watches click on the image below and be sure to give them a follow on Instagram and Facebook! Great outfit!! 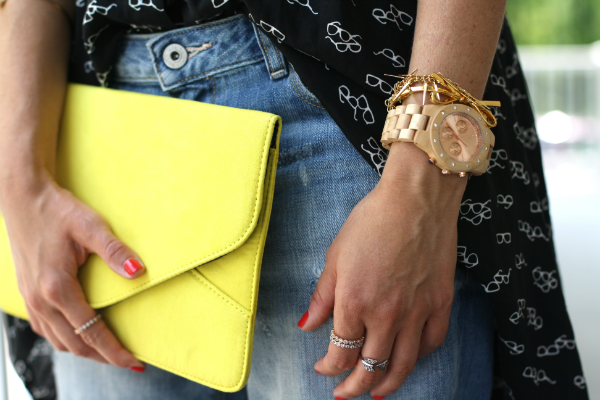 Lovely blouse and clutch! Love the print of your top, so cute! You rocked the big watch! I'm still a small watch fan but trying to break out of my mold. Thanks so much! I'm a fan of oversized watches for sure, but I do still love smaller faces as well. It really depends on the outfit! I'm getting a JORD watch in the mail soon and I can't wait! They are so gorgeous! I love how yours has a little bling on it! This outfit is so cute Jess! Love the photos.